The building that holds the Basque Culinary Center looks like a careening tower of hastily stacked plates awaiting a dishwasher. That makes sense. Gourmet metaphors are to be expected in food obsessed San Sebastian, the gastronomic capital of Spain, if not Europe. With numerous Michelin-starred restaurants and a penchant for pintxos (the Basque rendition of tapas), this beachside resort, a stone’s throw from France, treats the art of cuisine as a sacred trust. “Simply put, we love to eat,” says my guide, popping a vinaigrette-dribbled skewer of anchovies and ruby red peppers into his mouth with a deft sleight of hand. I’ve been on a short tour of the culinary center, located a few minutes from the center of town. With a curriculum dreamed up by a coterie of some of the world’s best chefs — think Ferran Adria of El Bulli and Rene Redzepi of Noma — the institute opened to students in 2011. It offers a four-year program meant to tackle not only food preparation but also the intellectual aspects of global food issues. With that in mind, nine world-renowned chefs gathered before the first classes began to prescribe a course of study that would turn students into socially aware food activists — even as their creative powers soared. So, while ensconced in this haven of gastronomic science, students don’t just experiment in the mad scientist-worthy molecular laboratory. No, future chefs studying at the Basque Culinary Center will garden (so they might comprehend the provenance of produce), make political statements (against such travesties as GMO foods) and study the senses (so they can adroitly use umami to augment bland dishes for the institutionalized). With attendees hailing from around the world, the Basque Culinary Center has visions of changing the history and empathy of the world though cooking. I am an easy convert. But, since I can’t take off four years to don a toque in San Sebastian, I decide to take advantage of the few days I have here for a mouth-to-stomach, hands-on tutorial of the eating frenzy sort. I start my powerhouse lessons in Parte Vieja — or Old Town. Along these narrow, cobblestone streets, in the shadows of ancient cathedrals, a bevy of bars and storied cafes turn out pintxos in abundant variety. Like tapas, pintxos evolved over Spain’s history. Tapas, originally the slices of bread used to cap a glass of sherry between tipples, went from utilitarian to gourmet when bartenders thought to cover the bread with a small snack — probably as a measure to keep patrons drinking longer. Eventually incorporating the myriad cultures that have left their legacy in Spain (the Romans, the Moors, the New World), the small snacks offered a melange of ingredients that grew well in Spain’s micro-climate: fragrant spices, olives, almonds, citrus fruits, corn, beans, peppers, beans and potatoes. In Basque country, these tapas took on a more elaborate flair and were christened pintxos (pronounced pinchos) — literally, spike, because many are served on skewers. I bury myself in pintxos research. For homework one night, I plan to do a de rigueur Basque crawl, much like a tapa expedition in Andalucia. That is, you never eat or drink more than one thing in one place — and you never linger long. That’s how they do it here.But when I stumble into a happening bar called Atari Gastroteka, across from Basilica Santa Maria, the pintxos look so scrumptious I realize I’m sworn by creed to gobble up everything in sight before leaving the joint. After all, what if I never return? So, I belly up to the bar and squeeze between throngs of locals, all multitasking (eating, drinking, talking in multiple languages and gesticulating) in that awe-inspiring Spanish way that no American dare mimic. I salivate over the possibilities. One called “Gilda” wraps an anchovy around four, thin, vinegary guindilla chile peppers and tops the bundle with an olive. Some embody more fanciful formations such as garlicky shrimp, tuna and arugula wrapped in cured salmon or Montadito, a tower of tomato, hard-boiled egg, tuna, asparagus and olives, dotted with parsley, grated carrot and onion vinaigrette. One pairs tender octopus tentacles with tiny potatoes and red peppers; another is beef cheeks, gracefully braised in red wine. Not tapas, pintxos distill the essence of a dish into one bite. Even when simple, they are more than snacks. 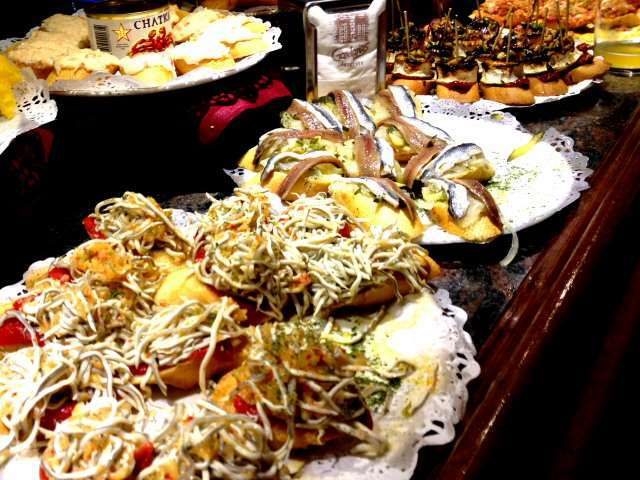 Pintxos are the Baroque architecture, the Grand Canyon, the Edith Head and Super Moon of tapas combined. So, armed with a glass of Txakoli, a young, bright white wine that the bartender pours with dramatic elan from above his head (to aerate and bring fizz, he says), I survey the options. When I can’t decide the bartender shrugs and picks something. He chooses “egg cooked at low temperature” — a non-descriptive moniker for literally the egg of my life. With a dandelion yolk, the egg is burrowed inside a dollop of mashed potatoes, then riddled with salty chunks of jamon and crunchy olive-oil fried croutons. Breaking local protocol, as long as I have a seat at the bar, I order two more things — a tuna-stuffed mushroom and bits of tender wild boar served on a bed of avocado. Before leaving, just because I want to watch the bartender pour from as high as his arm will reach, I order another glass of Txakoli. Back at my hotel, Maria Cristina, a recently revamped, century-old Belle Epoque icon, awash in gold leaf cornices, drippy chandeliers and a black-and-gold staircase worthy of Audrey Hepburn, I head to the Dry Bar for a nightcap. In homage to the film stars that base here during the annual San Sebastian International Film Festival (held in September), I order off the James Bond Martinis Collection menu. My drink, Never Say Never Again (Bombay Sapphire and Absinthe), says it all. I’ll be back. There are pintxos to be had, after all. Eat: While one could happily live on pintxos alone, foodies will want to indulge in a Michelin-starred meal. If you can do only one, go for Arzak, home to the great master of New Basque Cuisine, Juan Mari Arzak. You won’t regret it. Cook: If you don’t have time to devote four years to the Basque Culinary Center, learn to cook pintxos and other Basque delights with Tenedor Tours, run by acclaimed food expert Gabriella Ranelli. By Becca Hensley. First published in the Austin American-Statesman on November 23, 2015. For assistance with planning and reserving a trip inspired by this article, contact Becca Hensley at [email protected] or speak to your Departure Lounge travel advisor.